The spirits of ten legendary warriors, who in ancient times had saved the Digiworld, now present a new power to the Digidestined! To save the Digiworld from evil, Takuya, Koji, Tommy, J.P and Zoe must band together as a team to find their chosen spirits! The journey into the new frontier - the Digimon Frontier - is about to begin! 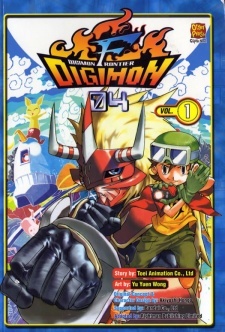 Digimon Frontier was published in English by Chuang Yi Publishing.